Today’s I’m showcasing Author Carolynn Carey who introduced her latest in the Barbourville Series last month. 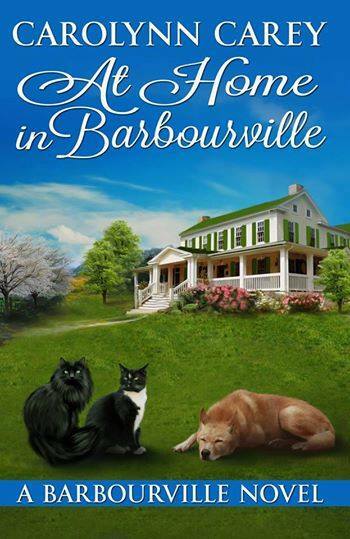 At Home in Barbourville is book six in the series. Adrienne Rani Day is happily convinced she’s left Barbourville behind for good. After moving away to earn a college degree and then getting an accounting job, she rarely thinks about the town where she was born and raised, although a certain fellow from Barbourville continues to haunt her dreams. Then an unexpected inheritance with a very interesting condition lures her back to Barbourville where she must face her past and try to explain her actions to the boy she left behind. Steve Travis is as shocked as everyone else when his Aunt Gertie’s will is read and he discovers she left her house and a good bit of property to the girl he once loved. Even worse, Aunt Gertie has made it a condition of the inheritance that Steve and the girl who rejected him must open a nursery together. He’s determined to keep their partnership on a professional level, but then an old adversary of Rani’s moves back to town and Steve finds himself attempting to ensure her survival while trying to unravel her reasons for leaving in the first place. I think the cover is simply breathtaking. The shades of blue and green are so inviting. I want to read the book for that alone, but the story inside is so rewarding its worth opening the cover.